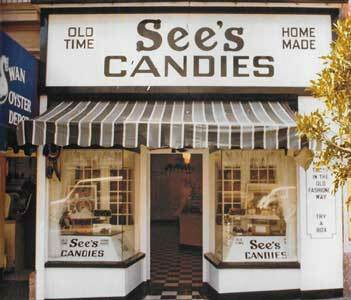 Take a sweet trip back in time through the history of See's Candies! Growing from a single shop in LA to one of the nation's most beloved companies, we've had many moments of deliciousness along the way—remaining as dedicated to taste, quality, tradition and service as ever. With dreams of starting his own candy company in sunny California, Canadian chocolate salesman Charles A. See moved to Los Angeles with his family and widowed mother, Mary See. 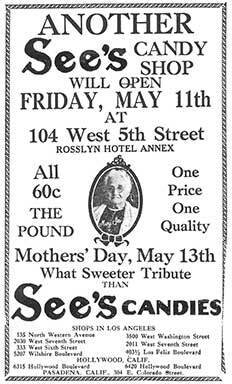 There, at 135 Western Avenue North, he opened the first See's shop, selling Mary's delicious confections made from her own original recipes. By 1925, there were a dozen See's chocolate shops across Los Angeles, including a location in the famous Grauman's Chinese Theater building. Motorcycle delivery service started in LA when Hugh Fry, a shipping clerk, would don a chauffeur's uniform and hop on a customized Harley to deliver See's around town. Customers included many Hollywood celebrities and movie stars! With so many Americans out of work, the Depression was a difficult time for businesses. 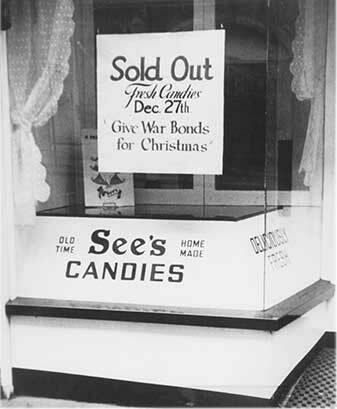 See's competitors were still selling candy at 80¢ per pound, and many were forced to close their doors. Charles See managed to reduce his prices without depleting the bottom line, charging only 42¢ a pound for pre-paid orders over 50 lbs. 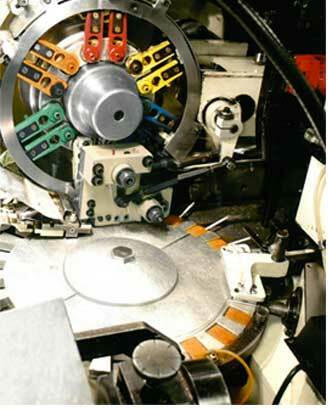 This innovative idea was the basis for our modern-day Volume Discounts pricing. 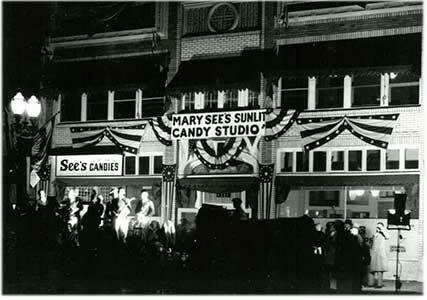 Despite the tough economy, Charles See forged ahead with plans to debut "Mary See's Sunlit Candy Studio," a See's chocolate shop and kitchen where customers could watch through giant plate-glass windows as See's confections were created using state-of-the-art equipment. Hollywood celebrities and eager crowds converged on the studio for an open house on November 24th, 1931. Though competitors were closing stores elsewhere, Charles sent his Sales Manager to San Francisco on a mission to open new shops, expanding See's operations outside Los Angeles for the first time. 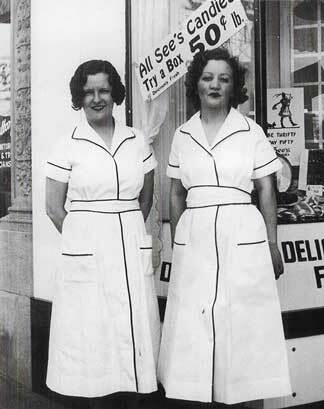 Within four years, there were 18 "Mary See's Dainty White Shops" all over the Bay Area. 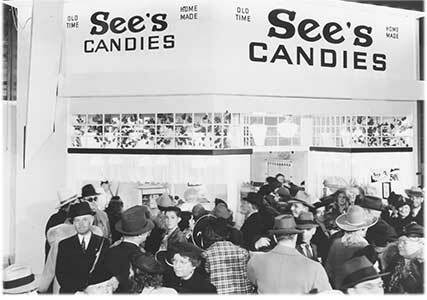 Visitors to the 1939 World's Fair were enthralled by an exhibit showcasing a See's Candies shop and miniature candy kitchen where people could watch candy makers hand-dip Scotch Kisses and Bon Bons. Thousands of visitors from across the country got their first taste of See's, and candy sales were phenomenal—helping the brand take off as a household name. See's opened an amazing 15,000 square-foot candy kitchen on the corner of Market and Valencia in San Francisco. Radio spots and newspaper ads invited the public to tour the building, taste the candy and enjoy up-to-the-minute amenities like air conditioning! Eight thousand people attended the grand opening. During the war, many raw ingredients such as butter, sugar and cream were rationed and in extremely short supply. There were heated discussions within the company as to how See's could stay in business without compromising on the quality of the recipes. In the end, they took a risk on a clever idea: using the best ingredients, but producing less candy. When a shop ran out after a few hours of sales, the shop closed for the day. 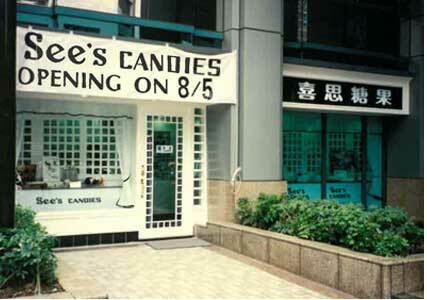 The plan worked—customers were willing to wait in long lines to buy their candy from See's, knowing that the company had kept their promise of quality. 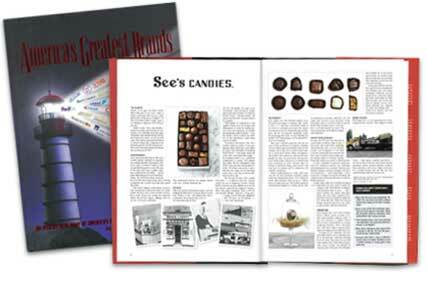 Laurance See was nine years old when his father founded See's Candies. 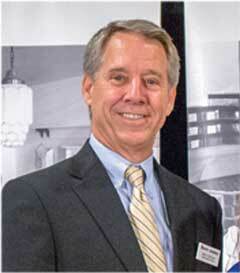 After graduating from Stanford University, Laurance soon became See's General Manager. In 1949, following three years of military service overseas, he returned to succeed his father as President. Laurance ensured that See's jumped on the television bandwagon early; opportunities to be televised, such as the Rose Bowl Parade, brought See's into living rooms nationwide. 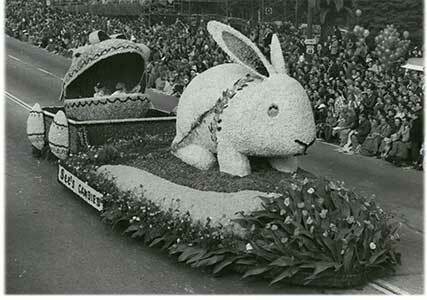 See's first-ever float in the Rose Bowl Parade was a giant 15-foot Easter Bunny pulling a cart with revolving Easter egg wheels, and was televised on New Year's Day. Joining the company in April of 1951 was one of the luckiest days of his life, according to Chuck Huggins. In the following years, he learned "See's version of how to run a quality candy business" inside and out, accepting various challenges and responsibilities as the company grew. When the opportunity arose, he was asked to run See's Candies as CEO, though he preferred to think of himself as "Chief Candy Taster." He continued to lead the company for 34 years. 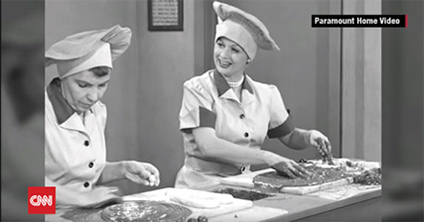 Lucille Ball (Lucy) and Vivian Vance (Ethel) visited the See's candy kitchen on La Cienega Boulevard to learn all about dipping and packing chocolates. The result was the hilariously popular I Love Lucy "Job Switching" episode! See's was the first company to come up with the idea of having chocolate delivered by a tanker truck in liquid form—all melted and ready to use! Chocolate is still delivered to the See's kitchen in this way today. 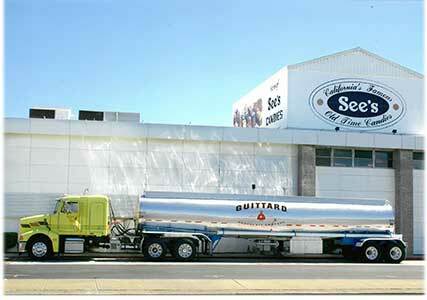 By the end of the 1950s, See's had expanded to 124 shops in California, employing over 1,000 people. 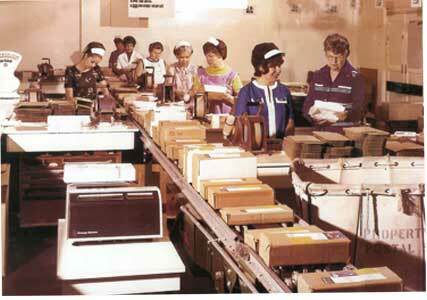 See's continued to expand over the next decade, including the development of a first-rate Mail Order department where candy was carefully packed and shipped out to customers. Little did they know back then—this was only the beginning of the company's delicious expansion! Laurance See figured that Phoenix might be the next region to experience a big population spike, and he was right. See's opened a shop in a mall in Phoenix—the first See's chocolate shop outside of California. 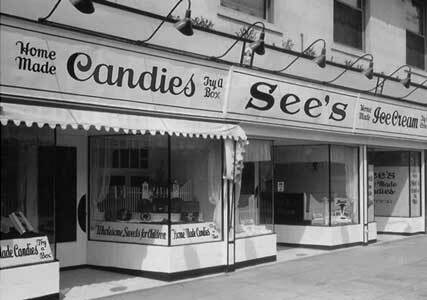 See's Candies became part of the Berkshire Hathaway family in January 1972, when Warren Buffett and Charlie Munger purchased the company. To this day, See's is one of Warren's favorite businesses! 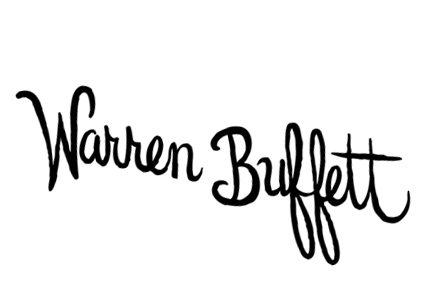 In fact, he loves his See's Candies Peanut Brittle so much that he enjoys it in front of thousands of shareholders every year, while speaking at the annual Berkshire Hathaway Shareholders Meeting. Firecrackers and a Chinese Lion Dance marked the grand opening of the first international See's Candies shop, located in the Ocean Terminal shopping plaza in Kowloon, Hong Kong. The shop is still open for business today. In December of 1985, after many years of development, See's finally perfected the truffle recipe and began offering these silky-smooth confections in shops. Loyal See's truffle customers still can't get enough! See's launched a brand-new website featuring a full-service online store, allowing customers to shop from around the world. 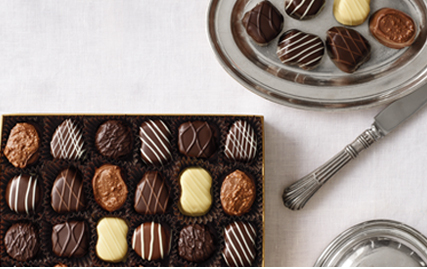 To this day, See's Candies fans can enjoy their favorite chocolates and candies delivered straight to their doorstep. 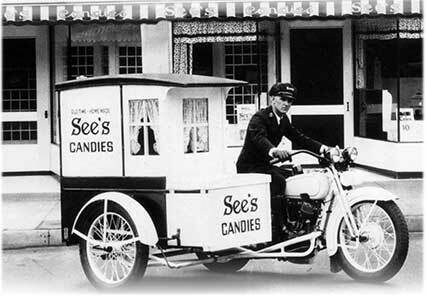 To celebrate See's Candies' 75th anniversary, vintage delivery vehicles were displayed on a roadshow across California. See's opened a kitchen at Rollins Road in Burlingame, CA, dedicated to making Lollypops and Little Pops®. From classic Butterscotch to seasonal Root Beer and Cinnamon, all of See's lollypop flavors are still produced in this unique candy kitchen. 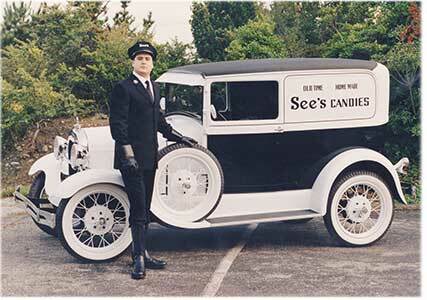 See's current President and CEO, Brad Kinstler, was picked by Warren Buffett to run See's Candies. 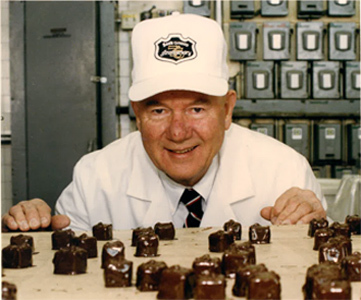 Though new to the candy business, Brad was no stranger to the Berkshire Hathaway family, serving as President of Cypress Insurance Company and President and CEO of Fechheimer Brothers, Inc. before joining See's Candies. On July 18th, Guinness World Records declared See's chocolate lollypop the World's Largest. 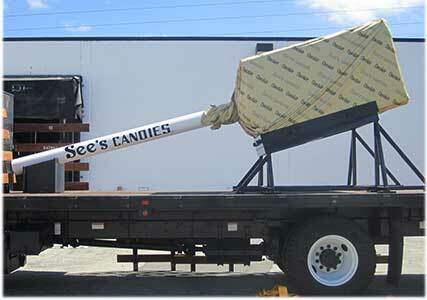 The giant confection, weighing over 7,000 pounds, was equal to 145,000 normal See's lollypops! One of America's Greatest Brands! In 2014, See's was named by Fortune as one of the 13 most American companies and included in vol. 11 of America's Greatest Brands, a prestigious list of companies that have earned the unwavering support of American consumers. See's core values of taste, quality, tradition and service were named as the basis of its success—values that were instilled by Mary See herself. 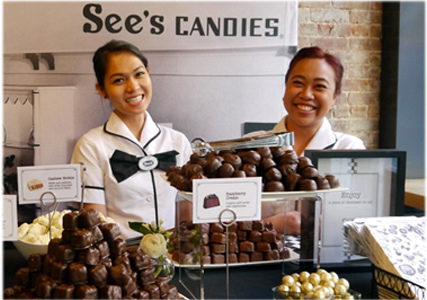 See's Candies was honored to rank highly on Indeed's list of the "Top 25 Best Places to Work" in the San Francisco Bay Area. Determined by the quality of star ratings left by reviewers, See's earned a spot in the top five among the very best Bay Area companies. 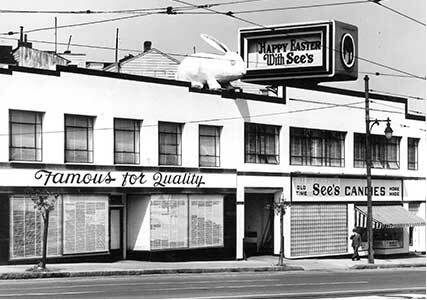 For over 95 years, See's Candies has been dedicated to making candy Mary See's way—helping to make the world a sweeter place, one piece of candy at a time. 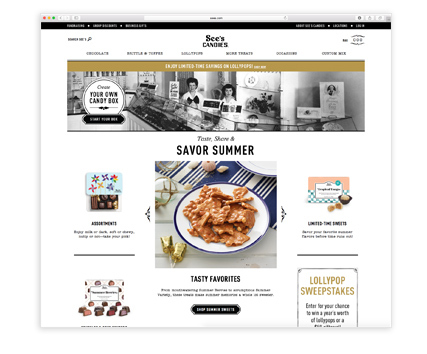 See's has grown from one shop to over 200 shops across America, plus a flourishing online store, without ever compromising on the best tasting, highest quality candy around. 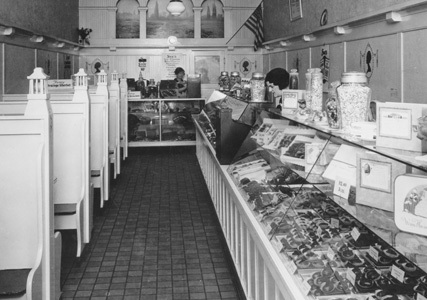 In fact, many of Mary See's original candies are still made today: Peanut Brittle, Chocolate Walnut Fudge, Victoria Toffee, hand-dipped Bon Bons and Maple Walnut Creams.